While answering the question about Shakhas of Vedas, I've read the verses of Srimad Bhagvatam and found that Yajnavalkya, upon the commend from (his Guru) Vaishampayana, vomited (relinquished) or given back the mantras of the Yajur Veda that he learnt from Vaishampayana. Those mantras are then called Taittariya Samhita or classified as Krishna Yajurveda. Yajnavalkya then worshiped Surya Deva to get those Yajur mantras which are even unknown to Vaishampayana! SB 12.6.66 — My dear brāhmaṇa Śaunaka, Yājñavalkya then desired to find out new yajur-mantras unknown to even his spiritual master. With this in mind he offered attentive worship to the powerful lord of the sun. SB 12.6.73 — Sūta Gosvāmī said: Satisfied by such glorification, the powerful sun-god assumed the form of a horse and presented to the sage Yājñavalkya yajur-mantras previously unknown in human society. If Shukla Yajurveda were not known to Vaishampayana, then it may be not known to even Vedavyasa or if Shulka Yajurveda were known to Vedavyasa, he didn't give/teach to Vaishampayana or any other Shishyas? 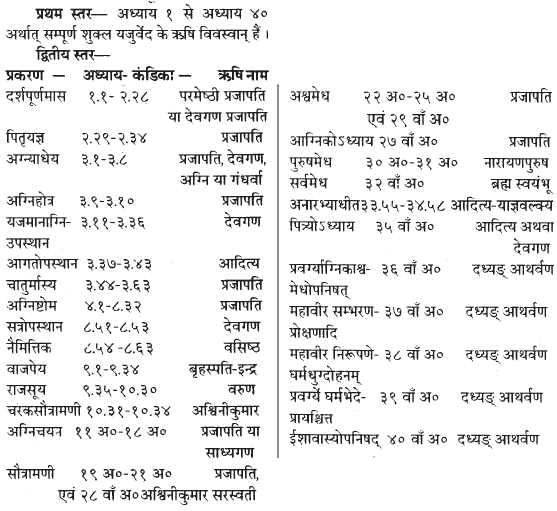 So, Yajnavalkya was not Drashta of any hymns of Shukha Yajurveda (Though there is mention of Aditya- Yajnavalkya as seer for 33.55-34.58 hymns however I'm not sure whether he is the same Yajnavalkya who got Yajurveda from Surya). That means Shukla Yajurveda was also there before Yajnavalkya got from Surya i.e as eternal as other Vedas. Was the Shukla Yajurveda unknown to Vedavyasa? if yes then How did Shukla Yajurveda lost before Yajnavalkya got from Surya? Browse other questions tagged vyasa shukla-yajurveda . Which Vishisthadvaita acharyas belonged to shakha of Shukla Yajurveda?